Massimilla’s latest book began as a handwritten manuscript from a long ago trip to Italy. Before the book could become what he envisioned, the briefcase holding his journal and notes were stolen. This is when he began to recover and recollect the pieces as best he could from memory. 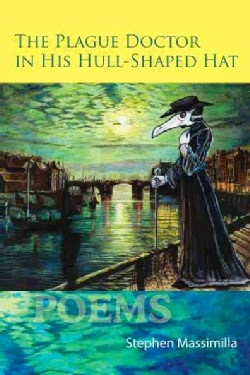 The Greek root of metaphor—“to carry from place to place”—opened a new perspective to organize the travel-based poems upon and The Plague Doctor In His Hull-Shaped Hat reared its head. While most of the poems in The Plague Doctor In His Hull-Shaped Hat show off the plumes of Massimilla’s Columbian educated vocabulary bank, the works I found myself drawn toward in the collection were the poems that were less verbose. The Parisian bookstore inspired poem “Even Plein-air-ists Do/Did Much Behind And On The Inside” and the culinary-based “How To Eat The Artichoke” are great examples within this type of work found in the book. The most enjoyable piece for this reader became “Self Portrait as a Fucked and Skinny Chicken.” The opening of the poem draws the reader into such a surprisingly wonderful and strange space. Such a powerful beginning. Now I lie to your face, tarnished. and burst in their song. The balance achieved throughout the collection on the language and style level is quite commendable. This is what I would consider one of its strongest feats—it does not become heavy in any set of poetic tricks or the common pitfalls of many collections: a lack of variety. Nor does the tone stick to the somber and dark space I envisioned with a title as foreboding as this collection holds. That the collection won the Stephen F Austin State University Poetry Series Prize Competition should come as no surprise. It is a thoughtful and charismatic book.